Today, we’ll take a look at the impact of both home prices and mortgage rates on your decision to buy a piece of property, along with the relationship they share. Obviously, both are very important not only in terms of whether you should buy (from an investment standpoint), but also with regard to how much house you can afford. What’s more important to a prospective home buyer? Or a lower home purchase price? Let’s do the math and find out! At the moment, mortgage rates are pretty close to historic lows, with the popular 30-year fixed-rate mortgage averaging 4.41% last week, according to the latest data from Freddie Mac. But while interest rates remain cheap, home sales are pretty flat, thanks in part to limited inventory, a lack of affordability, and perhaps inflated home prices. Yep, even though home prices are well off their housing bubble peaks in real terms, many feel they’re still quite high, and perhaps even unsustainable. This is made clear without the use of home price indices, fancy calculators, or algorithms…just take a look at some for sale listings and you’ll think home sellers are nuts for asking so much. Problem is most of them are listing below their Zestimate and/or Redfin Estimate and still aren’t getting any bites from buyers. Since home prices bottomed around 2012/2013, they’ve surged to new all-time highs, at least nominally (not inflation-adjusted). After the housing crisis, home values lost about a decade’s worth of appreciation, but gained much of it back when real estate boomed, thanks in part to the record low mortgage rates available. Unfortunately, home prices are predicted to be fairly flat over the next several years, and mortgage rates are expected to rise in 2019 (right?). So should you buy a property now while rates are still low and home prices have foreseeable flat or even downward pressure, thanks to all that appreciation already baked in? 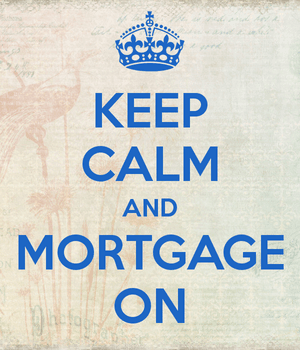 Or should you wait it out and let home prices pull back first, while hoping interest rates are still low? Well, first things first, it’s nearly impossible to time the market. Anyone will tell you this, whether it’s a home or a stock or anything else. Predicting the direction of anything can be a tall order, and real estate is no different. Home prices are also regional, and nowadays hyperlocal, so it’s not like they’re the same throughout the country. Not all home prices in the nation can be designated as cheap, average, or expensive – they vary tremendously, and so might their future trajectory. At the same time, it’d be hard to argue that mortgage rates nationwide aren’t super low. So which is more important here? Let’s take a look at a scenario where mortgage rates rise and home prices slump to see which situation is more favorable to the home buyer. Now imagine home prices fall 10 percent over the next year or two, while mortgage rates rise from 4.50% to 6.00%, which while possible, probably isn’t all that likely. As you can see, buying the home at the higher price point with the lower mortgage rate results in both a cheaper monthly mortgage payment and significantly less interest paid over the loan term. That could also make qualifying easier with regard to the debt-to-income ratio requirement mortgage lenders impose. However, the down payment is $8,000 higher on the more expensive house, which could prove a barrier to homeownership if liquid assets are low. But we’re still looking at overall savings of nearly $40,000 with the larger, yet lower-rate mortgage. Hopefully this illustrates the importance of low mortgage rates. Of course, there are a ton of variables that can come into play. Most people move or refinance their mortgages within 10 years or so from the date of purchase, making the long-term interest savings unclear. And you can’t change what you paid for a home, whereas you can change your mortgage rate via a rate and term refinance, assuming rates improve since the original date of purchase. Do Higher Mortgage Rates Lead to Lower Home Prices? While it seems to “makes sense” is it actually true? Now let’s discuss that relationship between mortgage rates and home prices, because it’s not what you might expect. There’s a common thought that once interest rates rise, they’ll put downward pressure on home prices. Using that logic, property values today could be artificially inflated based on the low interest rates available, which seemingly increase demand. And if mortgage rates rise, home prices might have to come down back down to earth. This is a bit of a myth, and the image above kind of illustrates that, though the data might also be cherry-picked to some degree. As you can see, house prices don’t just fall when interest rates rise. If anything, the opposite has happened in the past. Home prices and mortgage rates aren’t that closely correlated over time. In fact, mortgage interest rates may not really affect the price of housing at all. In other words, home prices may rise even if mortgage rates increase, despite it being more expensive to get financing for said purchase. 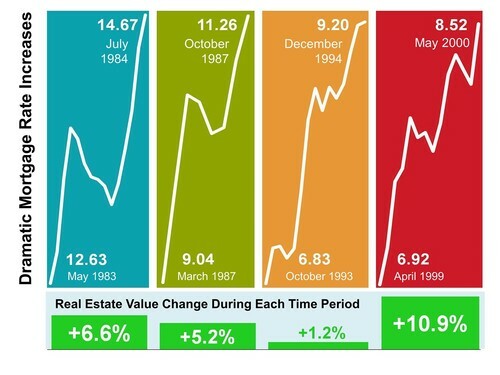 How Do Interest Rates Affect Real Estate Prices? Believe it or not, both home prices and interest rates may rise in tandem. This is partially because not everyone buys real estate with a mortgage, instead using cash, and also due to macroeconomic factors. If the economy is chugging along nicely, interest rates will likely rise to stem inflation concerns. In fact, the Fed began raising rates recently after getting signs that the economy may have been beginning to overheat. Then just like that, they halted the rate hikes over fears a recession could be looming. Ultimately, if the economy is doing well, home prices will also be on the rise because a strong economy means more jobs and higher wages, which leads to a greater number of potential homeowners. A solid economy also means the lending environment will be favorable, so even if mortgage rates rise, lenders will be doling out more loans with more flexible financing options. All of that can lead to more demand and even higher home prices. So don’t just assume home prices will drop if mortgage rates rise. And vice versa. Who knows, maybe mortgage rates will stay relatively low and home prices will fall over the next few years, increasing affordability for those looking to enter the market. POSTED IN » Mortgage Rates, Mortgage Tips, Vs.
A well thought out presentation. The only thing I could argue is you made a few assumptions that may not unfold. Interest rates may rise but with the FED and DC in control this is not a given scenario I would bet on. The one thing I will bet on is house prices continuing to fall until they come more in line with the local economy median incomes. Gosh, I hope the recent spike in mortgage rates doesn’t hurt the housing recovery. I see that you don’t believe it will, but I think the low rates were the only thing keeping prices up. Good point, but if demand still outweighs supply, home prices should rise. And a strong economy means more qualified home buyers. The latest Fed tinkering with mortgage rates (QE) is a unique situation, and as such, I believe home prices will fall. In recent history, rates were kept artificially low – it wasn’t due to macroeconomics, so I think prices come down as rates rise. Over time, the correlation may not be there, but with rates rising so quickly, it will have to at least slow home price appreciation. It will be interesting to see the chart prices vs. rates a year from now.